JW Fishers CT-1 cable tracking system was specifically designed to locate and track deeply buried power and communications cables. 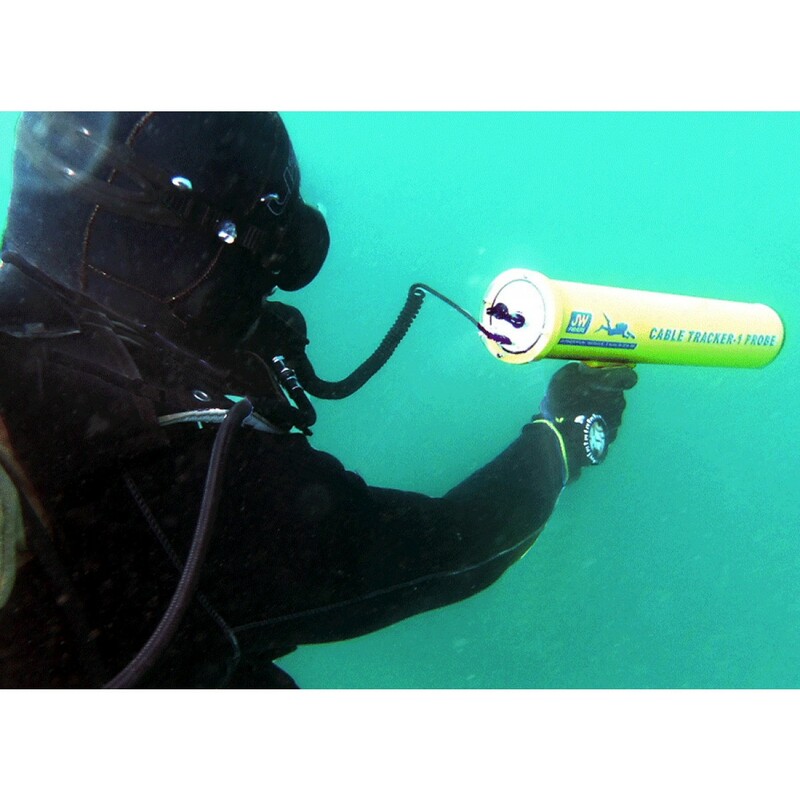 The cable tracker will locate cables on land or underwater. The CT-1 will not only track cables, but also identify faults or break points that are exposed to water.The CT-1 cable tracking system is so effective that in many cases the cable can be located and tracked from a small boat on the surface as the operator holds the nose of the probe in the water. Power is supplied by an internal, rechargeable battery pack that will power the CT-1 probe for 6-9 hours. The included battery charger connects to any 120 ac voltage source (a 220 ac charger transformer is optional). The CT-1 is constructed of corrosion proof urethane and PVC to give many years of trouble free performance and the modular construction allows for easy field repair should it ever be necessary. The CT-1 system consists of a shore based Signal Injector box and the Cable Tracker Probe. The Signal Injector is connected to the shore end of the cable and the Cable Tracker Probe is used to track the electromagnetic signal along the length of the cable. If the cable is a power cable transmitting at 60Hz (USA) or 50Hz (Europe), it can be tracked without the use of the Signal Injector. The CT-1 Probe will detect the 50Hz or 60Hz signal in the power cable. If the cable is a live multi-conductor communications cable, the signal injector will not be needed, the probe will pick up the 1024Hz signal. If it is a dead cable, or a fiber optics cable, the Signal Injector box must be used. The box is connected to the surface end of the cable. It creates a constant current electromagnetic field around the cable at 25, 50, 60, or 1,024Hz. The operator selects the frequency to be used. Once a signal has been induced into the cable, the Cable Tracker Probe frequency switch is set to match the frequency; 25, 50, 60, or 1,024Hz. The Probe receives the signal being transmitted and indicates the strength through both visual and audio readouts. First the cable is located and tracked on the surface, then the diver enters the water. The Probe is submerged and swept back and forth until a signal is received. When the probe is pointing in the direction of the cable, a null point is heard in the earphone, and less LEDs will illuminate on the display. As the diver descends to the bottom the signal is easily followed and the precise location of the cable can be pinpointed. JW Fishers Cable Tracker 1 (CT-1) system was specifically designed to locate and track buried power and communications cables. 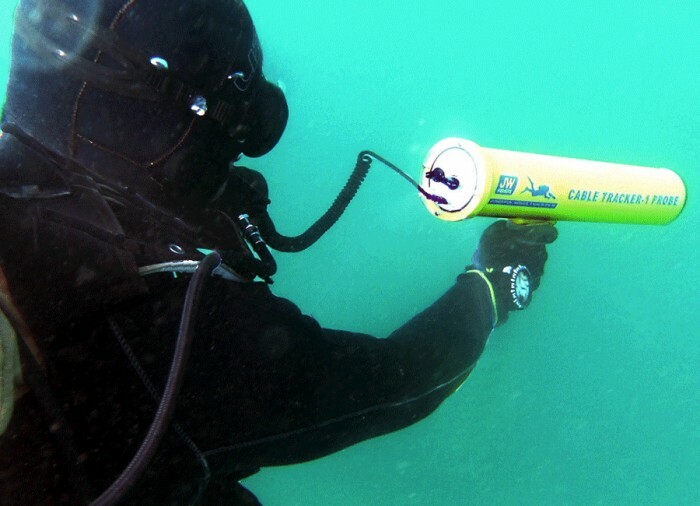 The system will locate cables buried on land or underwater. The CT-1 will not only locate and track cables, but also identify faults or breaks in a cable. 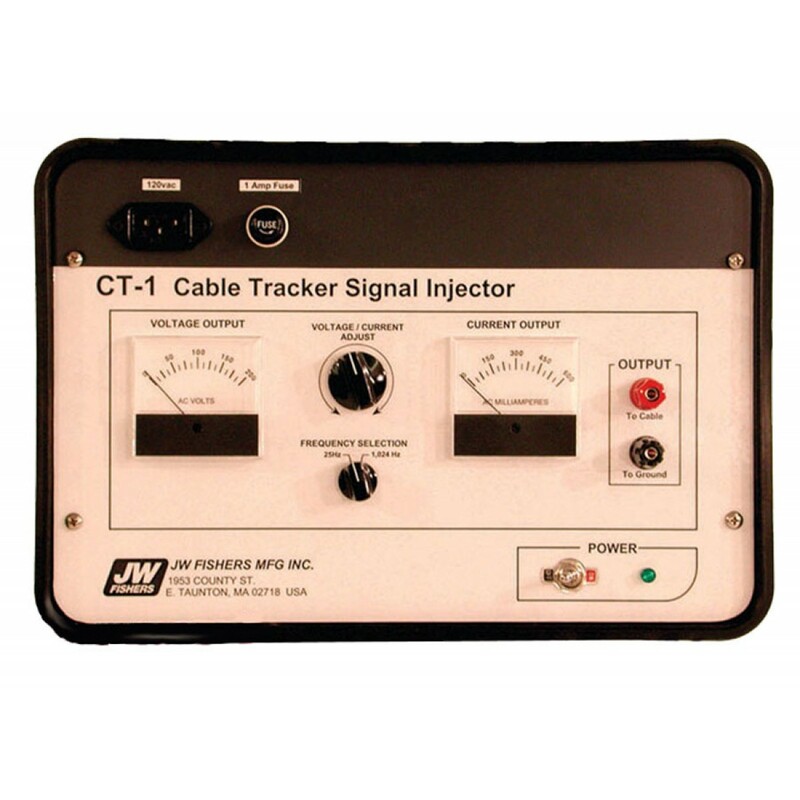 The Cable Tracker 1 system consists of the Signal Injector control box and the Cable Tracker Probe. The Signal Injector is attached to an exposed part of the cable on land. A25 Hz or 1,024 Hz signal is induced into the cable. 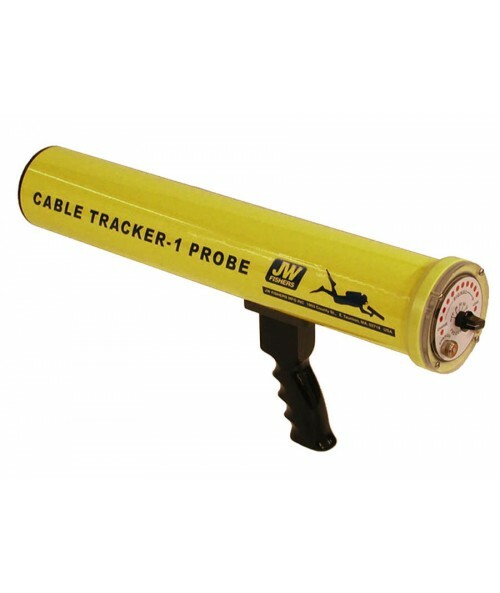 The operator carries or swims with the Cable Tracker Probe along the length of cable receiving the transmitted signal. Typically the lower frequency 25 Hz signal is initially used to locate the cable as it can be detected from greater distances. Once the approximate location of the cable is determined the 1,024 frequency is used to precisely pinpoint the exact location of the cable. When searching for power cables, or multi-conductor communications cables, it is not generally necessary to use the Signal Injector as the Probe can detect the frequency of the AC signal (50, 60, or 1024 Hz). A switch on the Probe allows the operator to select the frequency. So effective is the Cable Tracker 1 system at tracking and pinpointing cables that in many cases the cable can be located and tracked in shallow water from a small boat on the surface. The operator places the nose of the probe in the water and sweeps it back and forth until the signal is received. Once the cable is located it can easily be tracked from the surface. 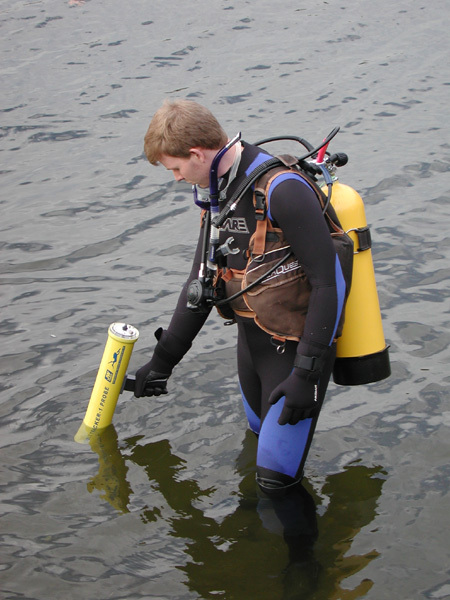 If necessary, a diver can be deployed to precisely pinpoint the cable position. An internal rechargeable battery pack powers the CT-1 Probe for 6 to 9 hours of continuous use. Two battery chargers are included with system; a 120 volt AC charger and a 12 volt DC charger. The Signal Injector is powered by 120 volts AC. 220/120 voltage converters are available for the signal injector and probe charger to power them from a 220 volt AC power supply. The CT-1 is constructed of corrosion proof urethane and PVC to give many years of trouble-free performance. The modular construction allows for easy field repair should it ever be necessary. The complete system is covered by Fishers TWO YEAR UNCONDITIONAL WARRANTY. 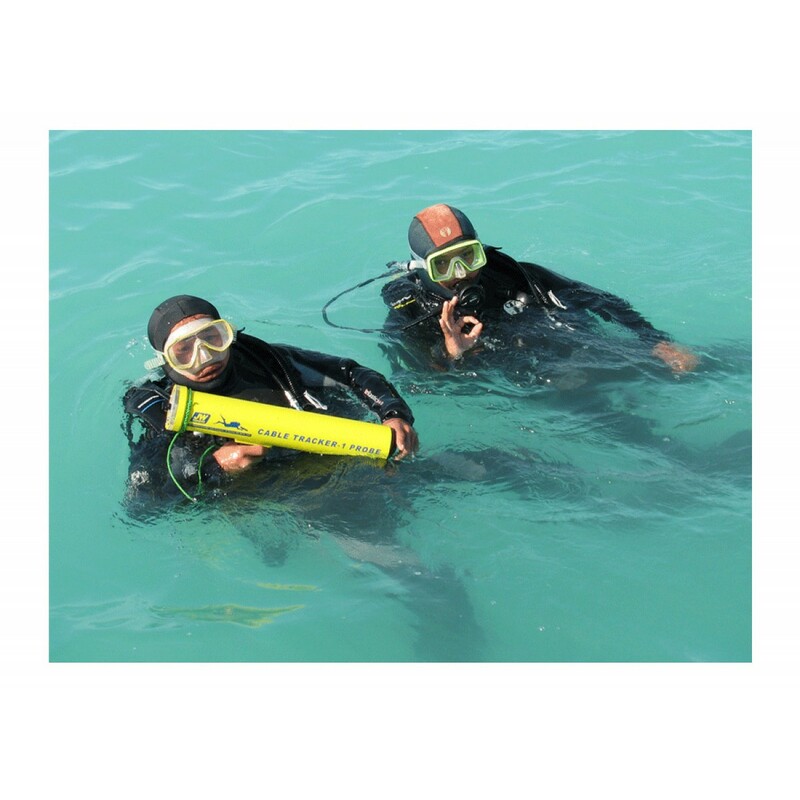 Cable trackers are devices that track buried cables on land or underwater. There are two parts to the system: a signal injector (signal generator) and a diver held probe (receiver). The signal injector sends out a signal and the diver held probe receives the signal. When the output of the signal injector is connected to a wire (conductor) on the surface, the probe can track the wire along its length even though it is buried. Whether the cable is buried in dirt, sand, under rocks, or coral makes little difference. The distance the probe can pick up a signal from the wire depends on soil conditions, frequency of the signal, and the quality of the instrument. Cable trackers can detect cables at much greater distances than metal detectors. The system will not track pipelines (use JW Fishers PT-1 Pipe Tracker to detect iron/steel pipelines.) The conductor (wire) that the signal injector is connected to must be insulated from ground for the system to work. Signal Injector : Top quality units have at least two different operator selectable frequencies; a low frequency for long range detecting, and a higher frequency for easy pinpointing of the cable. The output current (power) is also adjustable. This enables the operator to “crank up the power” for deeply buried cables or when it is desirable to track a cable from a boat. Top quality units have crystal controlled oscillators, precise output current regulation (not voltage regulation) of the signal, and are designed to eliminate “electrolysis” of the cable while the system is in use. Fishers Cable Tracker has all of these features. 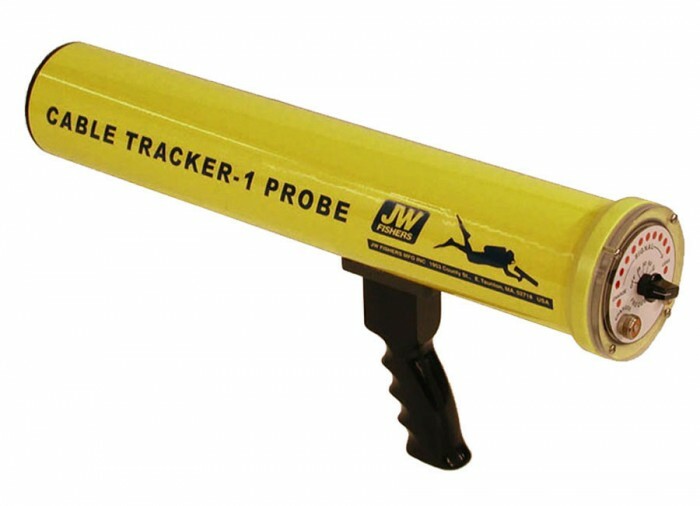 Diver Held Probe : The probe receives the signal sent out by the signal injector and indicates the strength of the signal on the probe’s readout. The probe has a frequency switch which makes it operator selectable to receive the different frequencies sent out by the signal injector. In addition to receiving the frequencies, the probe also has indicators showing the strength of the received signal. The closer the probe is to the cable, the stronger the received signal. The sensor in the nose of the probe is designed so that it is very sensitive except when the probe is pointing directly at the cable. This is called the null spot. It is this null spot that enables the probe to easily pinpoint the exact location of the cable. 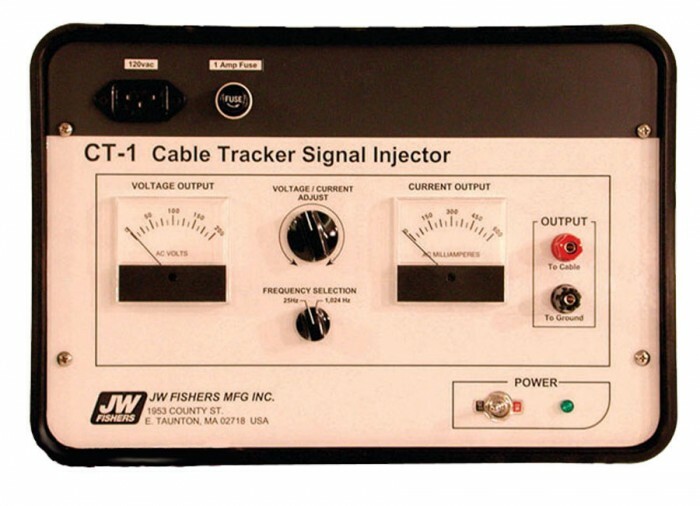 JW Fishers Cable Tracker 1 (CT-1) is a precision electronics system with a commercial grade Signal Injector and Cable Tracker Probe. 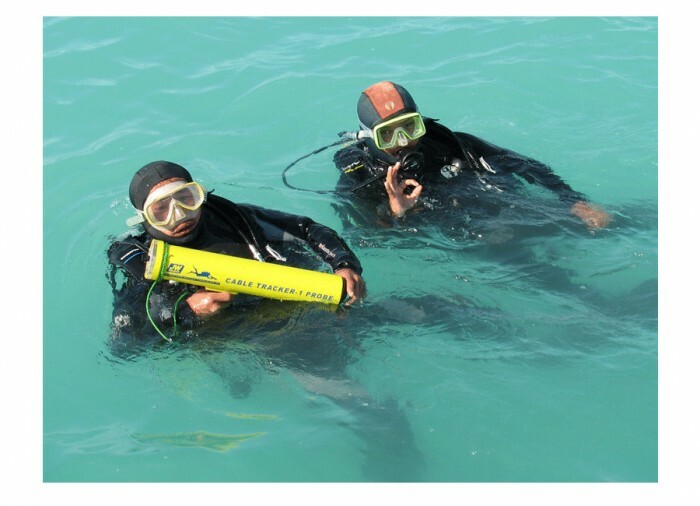 Specially designed to locate and track buried cables including power and communications cables, the system locates cables buried on land or underwater. The CT-1 will also identify fault or break points that are exposed to water. Fishers Signal Injector : The Signal Injector control box is used to create a constant current electromagnetic field around the cable at 25, 50, 60, or 1,024Hz. The Signal Injector is connected to the shore end of the cable and the Cable Tracker Probe tracks the electromagnetic signal along the length of the cable. In most cases the 1,024 Hz signal is injected because the higher frequency makes less interference from surrounding power wires. The 25 Hz signal is often used by the military for tracking cables. The Signal Injector has a switch to select 25, 50, 60, or 1,024 Hz, and a control knob to adjust output power. A low current setting (100 mA) is used for most cables and a higher power (up to 500 mA) is used for hard to find cables. Once the output power level is set, the output current is automatically regulated to give steady Probe readings. The Signal Injector is powered by 120 volts AC, or 220 volts AC with optional transformer. Fishers Probe : The Cable Tracker Probe operates on its own internal 9 volt battery pack. The Probe frequency switch can be set at 25, 50, 60, or 1,024Hz to match the signal source. If the cable to be located is a 50/60 Hz power cable, it can be tracked underwater without the use of the shore based Signal Injector. However, when tracking power cables on land the 1,024 Hz frequency may have to be used due to 50/60 Hz noise in the air. If the cable to be located is a live multi-conductor communications cable (no AC power lines), the 1,024 Hz frequency is used and will pick up the cable without using the signal injector. As the probe approaches the buried cable, the signal gets stronger in the earphone and more segments are lighting up on the LED bar graph indicating a stronger signal. When the diver is directly over the cable the signal will suddenly drop to near zero (called the null-spot). If the diver goes past the cable, the signal will jump to full scale again. The cable is easily pinpointed by pointing the Probe directly at the bottom and slowly moving the probe back and forth. The probe will be pointing directly at the cable when the readout goes null. Depth of burial can be calculated by taking a second reading with the probe held at a 45 degree angle and a second null point obtained. The depth of burial will be the same as the distance between the two null points on the surface. So effective is the Cable Tracker 1 system for tracking and pinpointing cables, that in many cases the cable can be located and tracked from a small boat on the surface. The operator holds the nose of the Probe in the water and operates it as stated above for the diver. Once the cable is located and tracked from the surface, the diver enters the water and descends to the bottom where the cable is pinpointed. We used this item for the local power company and it was spot on. We had a survey company conduct GPS markings and after 3 of the 12 days on the job they said our readings were in a straight line and on point with the line from point A to B which is 2 miles long. I will buy more products from JW Fisher.